Musicians interested in computer-generated music should take a look at Dr. T's Tunesmith. Tunesmith's theme generator allows up to five themes with three variations on each to be generated and accessed at any time. Also, advanced rhythm algorithms permit the creation of rhythmically consistent themes.The melody parameters allow the creation of melodies that range from the mundane to the bizarre, and variation algorithms assist in the creation of alternate themes logically extrapolated from the original themes. Up to six voices of MIDI output are obtainable, with each voice independently adjustable for articulation, delay, MIDI channel, octave, dynamics and muting. Parallel harmonies, counter melodies, echos, arpeggios, straight rhythms, cross rhythms and accent doublings are some of the effects that can be created, while drum algorithms allow the creation of percussion that can be derived from, or completely independent of, the melody. Also available from Dr. T's is Copyist DTP, a desktop music publishing, score-editing and transcription program, which supports both mouse and keyboard control, along with pull-down menus and windows. A complete set of musical symbols is provided, as is the ability to create your own. The program will transcribe treble, bass, alto and percussion clefs, and allows you to convert any of the supported formats to any other. Complete editing functions simplify the transcription process. Quantizing is also available. Sequencers that can be transcribed with Copyist DTP include KCS, MIDI Recording Studio, Steinberg Pro 24, Texture, Sequencer Plus, Mastertracks and SMUS. 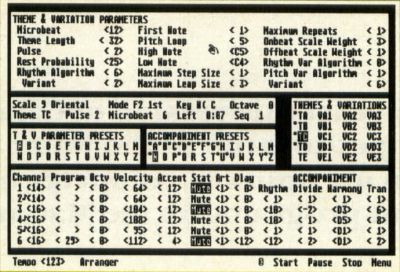 The program also reads standard MIDI files. 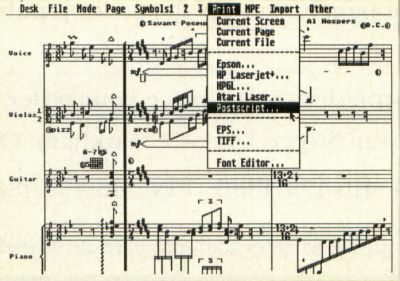 All Postscript printers are supported, as well as the Atari laser printer, HP Laser-jet Plus, HP plotters, and Epson FX- and HP Inkjet-compatible dot-matrix printers. Maximum score length is 100 pages. Copyist DTP retails for $399. Two simpler versions, Copyist Apprentice and Copyist, are also available for $99.99 and $249.00 respectively.